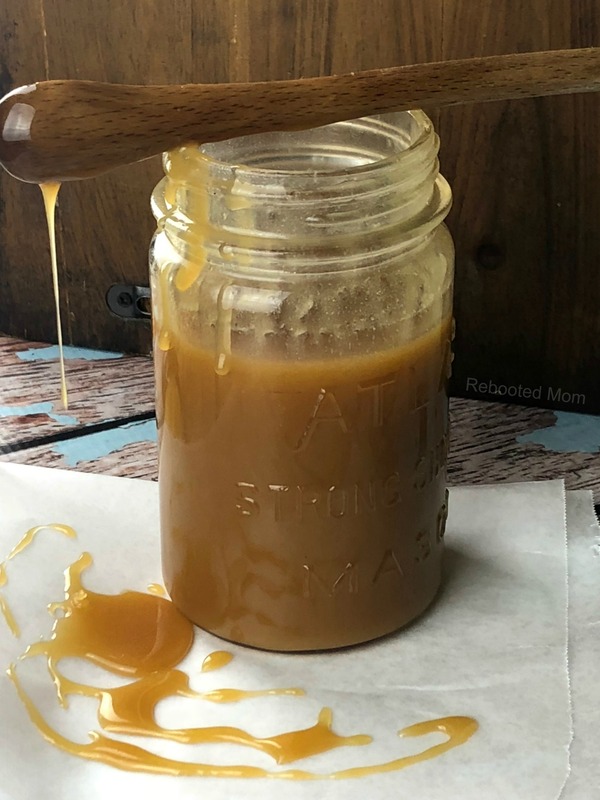 Use an abundance of whey to make this delicious whey caramel sauce, made quite easily at home with just a few simple ingredients! For anyone who has made their own homemade yogurt, fresh, soft cheese or even ricotta cheese, you probably know that the process results in a lot of whey. 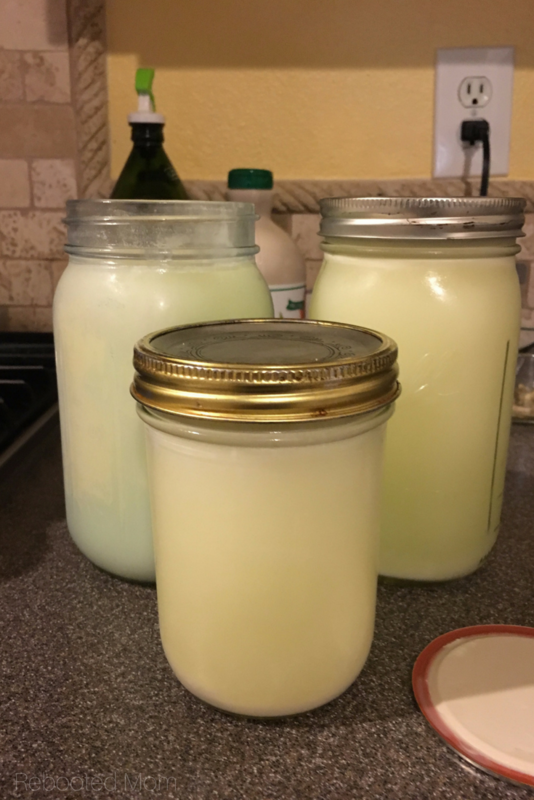 If you are using a full gallon of raw milk to make yogurt or fresh homemade cheese, then you’ll have at least half of the milk separate into whey. Whey lasts about 2 weeks in the fridge. The best part about having these jars of whey is that you can use for a lot of things. Use as a marinade, in your skin care, soaking beans or soaking grains. Though I typically use it to rinse my hair every few days, it has been working wonderful on my acid-loving plants in the garden. But since that requires so little whey, I usually have quite a bit left. One of my favorite ways to use it is to make this delicious whey caramel. Yum! Whey is the byproduct when you strain your homemade yogurt or make homemade cheese. Making fresh cheese with lemon juice or vinegar results in acidic whey, which has quite a few uses around the house (as a marinade, soaking beans and even fermentation), garden and even in your beauty routine. Whey contains milk sugar, some minerals, and a little protein. It contains glycolmacropeptide, which helps lower your appetite by promoting the secretion of hormone cholecystokinin – which means it helps you stay fuller, longer, without eating all too much. If you have access to raw milk, then you can use that gallon to make your own homemade cheese or yogurt, then turn around and make ricotta, and then also use the leftover whey to make caramel sauce. Using whey to make caramel is a fairly simple but lengthy process. All of the lactose (sugar that gives milk its sweet taste) is contained in the whey. When you cook the whey for several hours, the whey takes on a caramel flavor. You can caramelize whey by cooking on low heat for several hours, all while stirring frequently, but the high concentration of lactose will result in a grainy whey caramel. To help battle this we add sugar as we cook the whey down – which prevents the whey caramel from becoming grainy. If you are making caramel from sweet whey, it’s best to add a little lemon juice to prevent the sugar from crystalizing as the water evaporates. If you are using acidic whey, you shouldn’t have a problem — using whey and sugar alone will yield a fantastic result without any more acid added. Start by adding your whey to a stockpot and simmering on low/medium for around an hour until it is reduced by almost half. 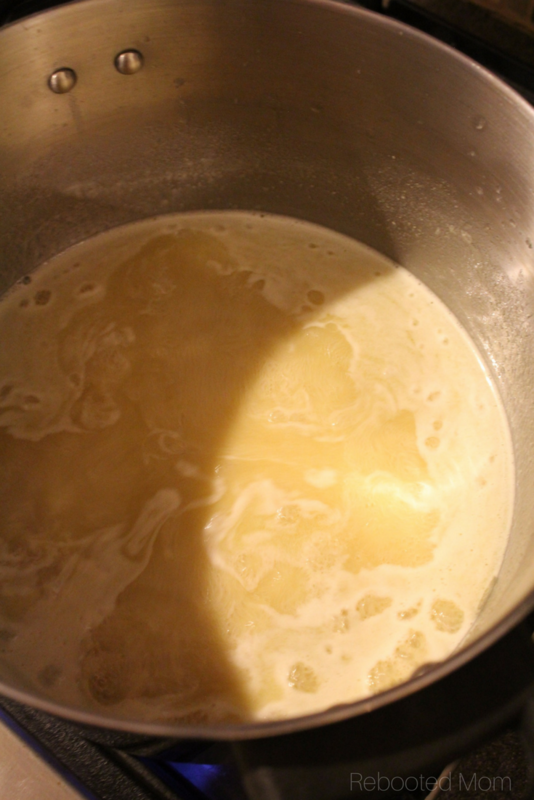 Then add the sugar and the butter, and stir frequently on low/medium until dissolved. Turn the heat up ever so slightly to medium, and keep a close eye as it starts a low boil. I kept mine at medium, and it took around 45 minutes to get to this point – don’t walk off too far. It’s best to tackle things in the kitchen while you wait than allow it to scorch the pan. Over time, the mixture will slowly become darker and thicker – as it thickens it will start to foam, but by stirring constantly during this stage you can keep it from foaming over the pot. Be cautious – because it thickens so quickly and if you aren’t watching you will risk burning the caramel. This whey caramel results in a lighter version of the thicker dulce de lech that you could use and drizzle on ice cream, drizzled on desserts or even pancakes, or gifted to neighbors for the holidays. Refrigerate the caramel and use within 2 weeks. Once refrigerated, it will harden up – simply reheat to enjoy as pictured above. Transform whey from cheese or yogurt making into a delicious, whey caramel that's perfect for drizzling on desserts, pancakes or even ice cream. Add whey to a heavy stockpot on low/medium heat and simmer down at least 1/2 over the course of an hour. (Low and slow is better than risking it by scorching the pan on too high of a temp). Once reduced, add the sugar, vanilla bean seeds, butter, and lemon juice (if using sweet whey). Stir occasionally on low/medium until well combined, then slowly raise the heat to medium. Stir frequently, as over the next 30-45 minutes the whey will slowly start to caramelize and reduce to a syrupy consistency. Be patient because it can scorch if left unattended. 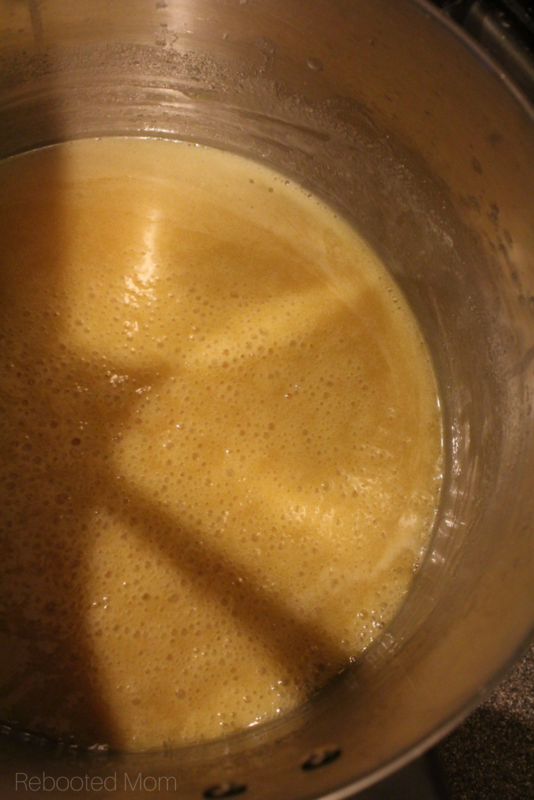 The whey will slowly change colors and become more brown, then start to foam - continue to stir more often as it caramelizes incredibly quickly. Once it thickens to the point that it coats the back of a spoon, remove from the heat and stir as it cools. The whey caramel will thicken considerably as it cools. Make sure you use fresh whey, not whey from powder as sold in stores. Cover and refrigerate whey once cooled. Store in the refrigerator for up to 2 months. Share the post "How to Make Whey Caramel"